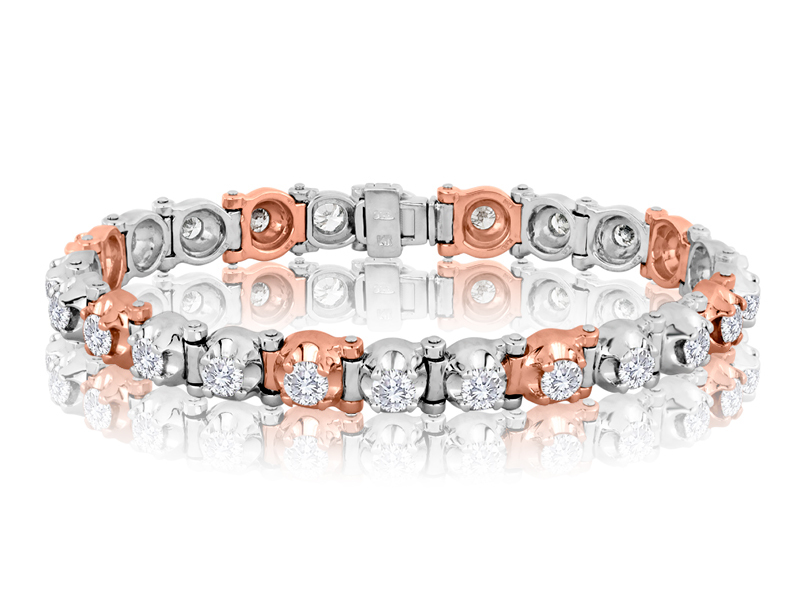 Our 14K tennis bracelets bracelets are made in New York by the same craftsmen who make our Add-a-Links. Our assembly method is the same - 14k wire and tubes - to insure superior wearability and durability for your bracelet. Additionally we can build ours to custom sizes and, should the need arise over time, add or remove a link from existing bracelets to adjust the size as necessary. Available from 2 CT TDW on up. 18K gold and rare natural yellow and brown cushion cut diamonds. These are one-of-a-kind items that cannot be replicted. The total diamond weights range from 7 to 10 CT depending on the selection of diamonds used. These are statement pieces for those who truly appreciate natural color diamonds and fine craftsmanship. We hand set one, two or three rows of fine white diamonds into 18K gold hinged bangles to yield beautiful 3/4 CT, 1 1/3 CT and 2 CT TDW finished bracelets. Only the finest pave setting done here in New York yields the most secure and strongest setting for your fine diamonds. Available in small wrist sizes and yellow and pink gold as well.